November 29, 2017, 12:12 p.m. If you’ve looked at a newspaper in the last couple of days you might be forgiven for thinking that the entire country was engrossed with Prince Harry’s engagement to Meghan Markle. However, fully half of Brits (52%) say they are indifferent to the news of the engagement. Four in ten (39%) say they are pleased, a further 4% are disappointed, while a final 6% don’t know. Older people, Conservative voters and women are the most likely to be pleased by the news (at 49%, 48% and 47% respectively). These groups are the only ones who are more likely to be pleased than indifferent. At the other end of the scale, Scots (62%), men (also 62%) and Labour voters (59%) are the most likely to view the engagement with indifference. While Markle has announced that she will be giving up acting in order to focus on Royal duties, around half (49%) of Brits want her to continue to have a normal job. This is almost twice the 26% who think she should dedicate herself to Royal duties. A further 25% don’t know either way. Attitudes towards Markle’s future work vary most by age. The youngest Brits questioned – those aged 18-24 – are most strongly in favour or Markle continuing in a normal job (65% compared to just 11% who think she should carry out Royal duties full-time). By contrast, the eldest Britons – those aged 65 and over – are the most likely to think Markle should devote herself to Royal engagements (42% vs 36%, making them the only age group who are more likely to think she should be doing Royal work than regular work). With Markle’s official entry to the House of Windsor now just a few months away, YouGov has added her to our approval tracker of prominent Royals. Close to half (49%) of Brits have a positive view of the actress, while only 14% have a negative view. The remaining 37% say they don’t know (a much higher rate than among the rest of the Royals, who are on 7-15%). 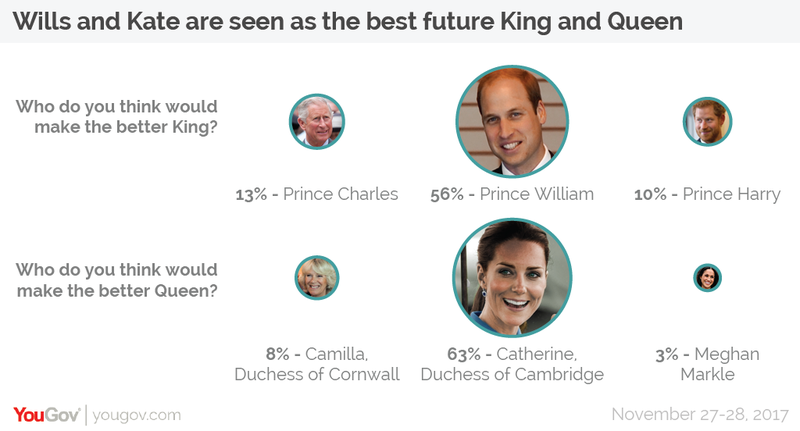 Opinions on the remaining Royals haven’t changed much since the survey was last conducted in 2013, with the exception of Prince Charles and Camilla, Duchess of Cornwall. 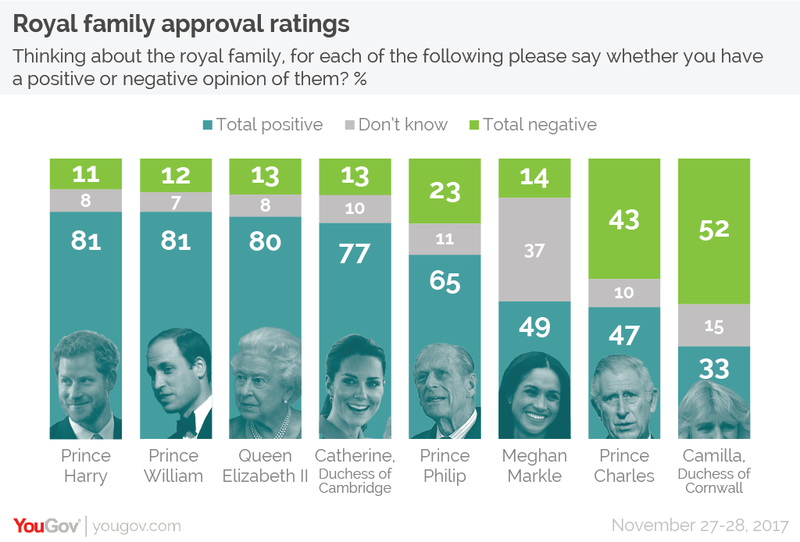 In that time the proportion of people with positive views of the Prince of Wales have dropped from 60% to 47%, with negative views climbing from 33% to 43%. Likewise, today only 33% of people have a positive view of Camilla, compared to 43% in 2013, while 52% have a positive view – an increase from 45% in 2013. Spectator columnist Melanie McDonagh came under fire for saying that Markle was unsuitable to marry Prince Harry because she is a divorcee. Such an objection was one of the reasons Harry’s great granduncle King Edward VIII had to abdicate the throne in order to marry Wallis Simpson. However, in 2017 McDonagh finds herself on the wrong side of public opinion: 78% of Brits say it would be acceptable for a member of the Royal Family to marry someone who is divorced. A similar proportion (79%) are fine with the prospect of Royals marrying foreigners (Markle is American, as was Simpson). The public is also broadly relaxed in its attitudes to Royals marrying someone of a different ethnicity (Markle is mixed race), or someone of a different religion (Simpson was Catholic). The only issue that would generate real opposition would be if a Royal wanted to marry someone of the same gender. Here the public are split, with 44% saying it would be acceptable and 41% saying it would be unacceptable, with Conservatives and those aged 65+ the most opposed to such a union. While all the excitement may be around the impending marriage of Harry and Meghan, it is Prince William and Catherine, Duchess of Cambridge who are still by far seen as the couple most likely to make the best King and Queen. When asked to choose between him, his father and brother, more than half (56%) of Brits think Prince William will be the best King, while Prince Charles is the choice of one in eight (13%) and Prince Harry is the favoured option of one in ten (10%). Likewise, approcahing two thirds (63%) imagine that the Duchess of Cambridge would be the best Queen, far ahead of Camilla (8%) and Meghan Markle (3%).